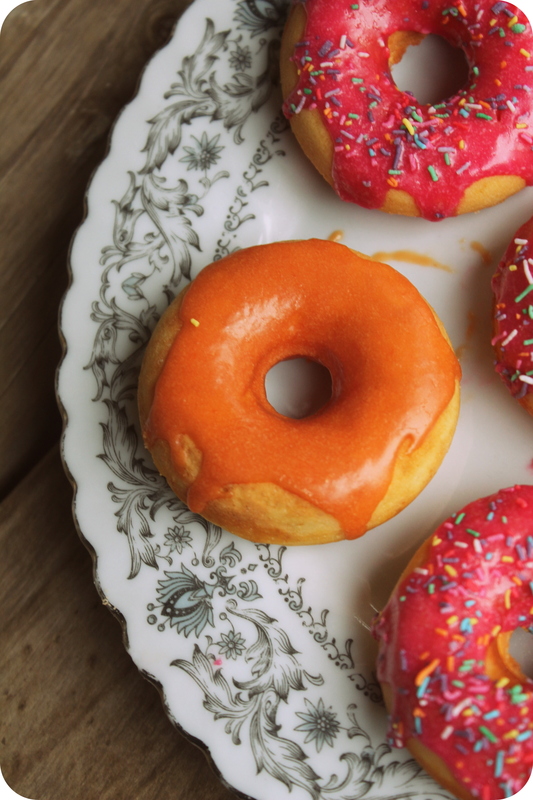 Sour orange doughnuts! They are SO good, my sister ate the lot and I only got one. I had this doughnut mix sitting in the cupboard…it had been there since before we went to England…over 3 months now!!!! (It smelled all right 😛 ). Well I was feeling like something yummy and easy to make (pretty much just feeling piggy and lazy) so I got out my 3 month old jar of doughnut mix, added the butter and milk etc, and then decided I should put the effort in and make up a cool flavour. There are so many oranges ripening on our trees, so I squeezed an orange into the batter. 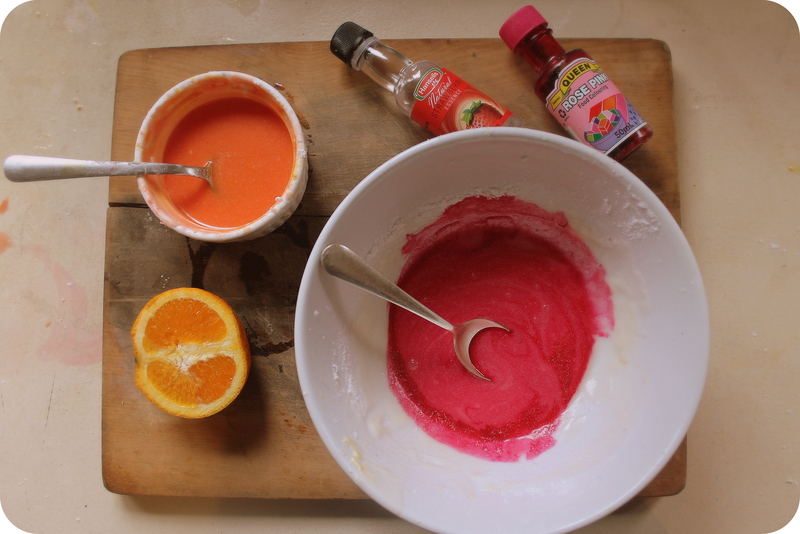 Then I mixed up some white icing (butter, water, icing sugar…) and added orange colouring, orange juice and citric acid. Citric acid is basically sour white crystals that look like salt or sugar. In New Zealand, Citric acid is a common ingredient for getting sour flavours. In England, I think you have to buy it from a chemist or something. But anyway, it makes a delicious sweet-sour icing when I added about 1/2 a teaspoon. I also made bright pink strawberry flavoured icing, for no other reason than I think pink doughnuts are just so cute! But they didn’t taste that good, kinda boring. 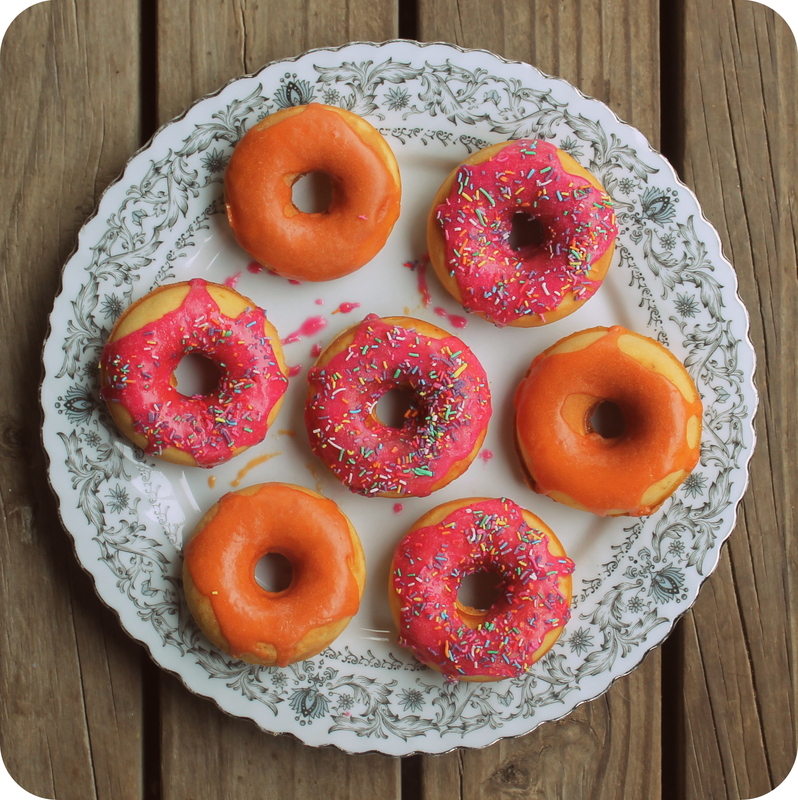 The pink ones actually didn’t all get eaten – they are still sitting in the pantry! My 3 month old doughnut mix doughnuts came out great! 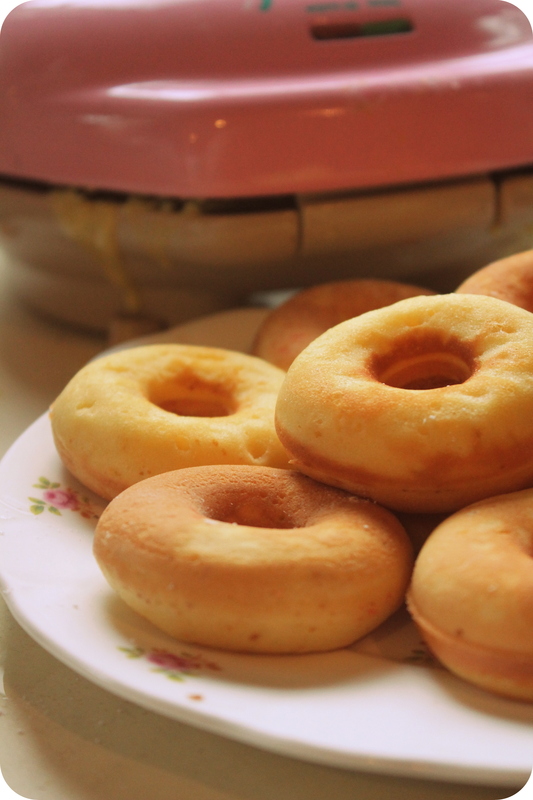 The recipe for making the doughnuts in a doughnut maker is here, If you want to make doughnuts like this, see my post. I really think that doughnuts like this are NOT as delicious as traditional deep-fried ones, but on the other hard, they have much less fat. They are quicker and easier too. Put on tablespoon of butter in a microwave safe bowl. Melt the butter in the microwave, add about a tablespoon of boiling water and stir in enough icing sugar to make it a nice smooth paste. If it is too small an amount, add more water and keep adding icing sugar, little bits at a time into you reach the right consistency. Add in about 1 tbsp of orange juice or a couple of drops of orange flavoring. Stir in citric acid to taste. (You might not like it too sour or you might like it really sour.) Remember that the sourness is balanced with the sweetness of the doughnuts. 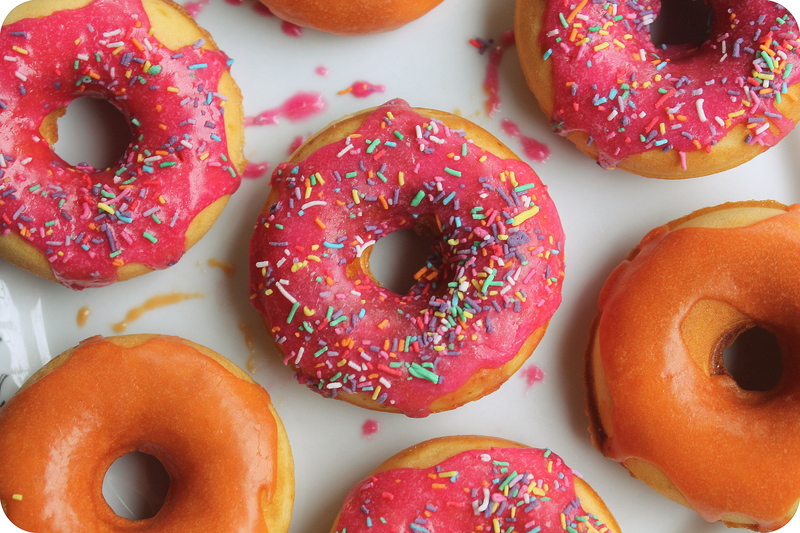 Colour the icing as bright as you want, and ice the cooled doughnuts. They are SO yummy, you have to try it. I think this would also be nice on cupcakes or a chocolate cake. Orange and chocolate really go well. The pink ones look pretty, but don’t bother with them. The orange ones taste great.